Biological control of pests, weeds, plants and animals gives “the best hope to providing lasting, environmentally sound and socially acceptable pest management,” according to a new book edited by two UF/IFAS scientists. The book, “Prospects for Biological Control of Plant Feeding Mites and Other Harmful Organisms,” was recently published by Springer Science. It includes chapters by scientists in California, Kenya, Benin, Brazil, Colombia, Greece, Spain and New Zealand. Research compiled in the book examines how predatory mites can be used to control other plant-eating mites and other harmful organisms such as stable flies, mushrooms flies and some soil pests, said Daniel Carrillo, a UF/IFAS assistant professor in entomology. The book serves as an important resource for anyone searching for efficient and sustainable biological methods of pest control. Biological control is vital because pests become more difficult to control as they build resistance to pesticides. Florida growers and greenhouse operators have used biological control for years, he said. For instance, when an exotic pest is introduced in Florida, scientists find the origin of the pest and try to identify its natural enemies. Then they import the most effective natural enemies and test them to be sure they’re safe to use. Moreover, native predators and parasites can also play a key role in pest management. Predatory mites have been used as biological control agents for years. But their use has been limited to predators of the family Phytoseiidae. So, the book looks at other groups of predatory mites that could be used in biological control, Carrillo said. As Carrillo explains, some mites prey on other bugs, while some damage plants and crops. The trick is to distinguish pest mites from predatory mites. He said he hopes to eventually see more commercially developed biological control agents, including mites, in the U.S.
“We have to identify efficacious natural enemies, make sure that it is safe to use them and figure out a way to rear them as biological control agents on a massive scale,” said Carrillo, one of the book’s editors. Carrillo, Jorge Pena, professor emeritus in entomology -- both faculty members at the UF/IFAS Tropical Research and Education Center in Homestead, Florida – edited the book along with Gilberto Jose de Moraes, an agriculture professor at the University of Sao Paulo in Brazil. Several companies produce mites on a massive scale and distribute them to greenhouse operators and growers to help them control such pests as thrips, whiteflies and spidermites, Carrillo said. Many predatory mites are not used for pest control because few scientists study them, Carrillo said. Lately Brazilian scientists have had the best success in developing biological control agents of plant-eating mites. 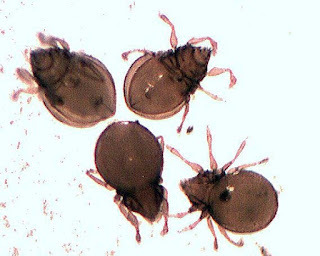 Research will continue to look at classifying and studying the biology of the many mite species that could be used in pest management, the first step toward developing them as biological control agents, he said.